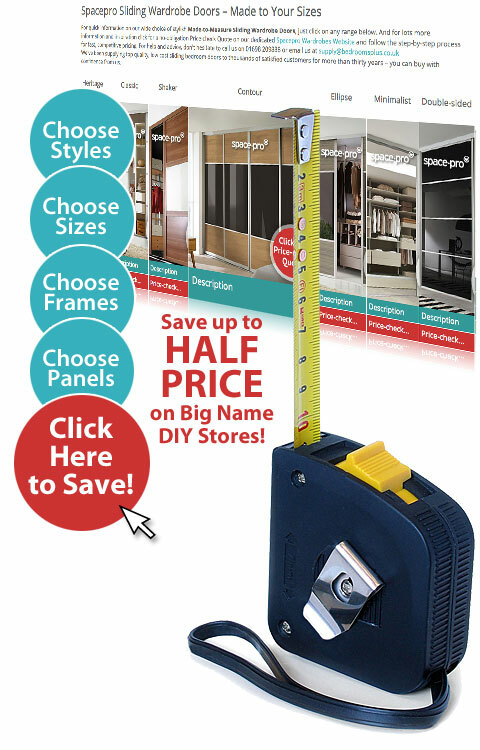 SAVE up to HALF PRICE on big name suppliers when you buy sliding doors from Bedrooms Plus. Our simple Made-to-Measure Request a Quote system enables you to choose from the full range of Spacepro Sliding Doors to fit your exact dimensions. You can specify your choice of door panels and frames to suit the decor of your room. Measuring your maximum dimensions then allows us to prepare a personalised quote just for you – and you won’t be disappointed. Our low overheads and competitive pricing typically beats even the big name DIY stores by a massive 47% on average! That’s right, you can easily save up to HALF PRICE by choosing Bedrooms Plus for your sliding wardrobe doors.